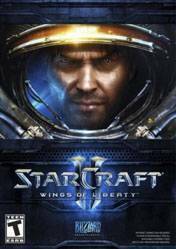 StarCraft II: Wings of Liberty is a military science fiction real-time strategy video game developed and released by Blizzard Entertainment for Microsoft Windows and Mac OS X. A sequel to the award-winning 1998 video game StarCraft and its expansions, the game was released worldwide on July 27, 2010. It is split into three installments: the base game with the subtitle Wings of Liberty, and two upcoming expansion packs, Heart of the Swarm and Legacy of the Void. Set in the 26th century in a distant part of the Milky Way galaxy, the game revolves around three species: the Terrans, human exiles from Earth; the Zerg, a super-species of assimilated life forms; and the Protoss, a technologically advanced species with vast mental powers. Wings of Liberty focuses on the Terrans, while the expansions Heart of the Swarm and Legacy of the Void will focus on the Zerg and Protoss, respectively. The game is set four years after the events of 1998's StarCraft: Brood War, and follows the exploits of Jim Raynor as he leads an insurgent group against the autocratic Terran Dominion. The game includes both new and returning characters and locations from the original game. For all the fans out there, a very successful and great RTS game. This game is so fun but I can only do the trial ;~; Hopeuflly I&#39;ll get it one day.